Interior of a dolls house scale wooden tack trunk with moveable drawers or trays and space for a scale saddle. Photo copyright 2010 Lesley Shepherd, Licensed to About.com Inc. This basic wooden trunk or chest is useful for a number of miniature, model horse and dolls house displays. The trunk shown here is based on a full size wooden captain's chest from the late 1800's. 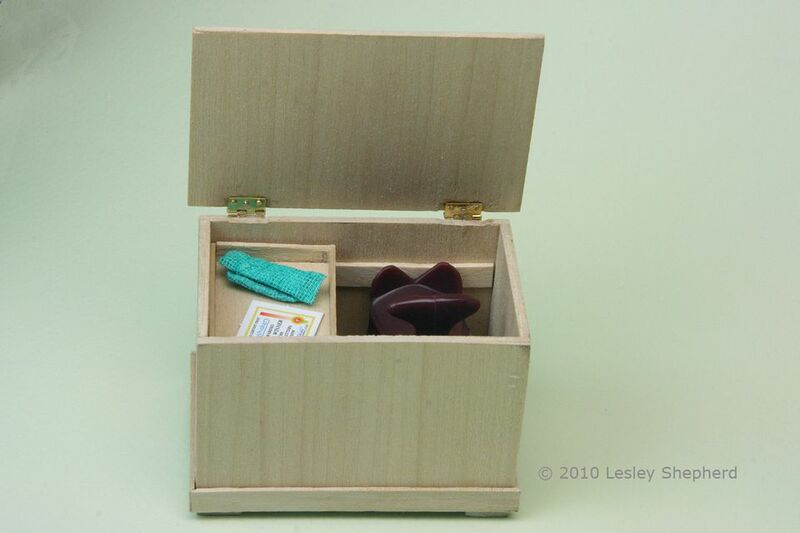 The box construction with a hinged lid and sliding trays, allows you to display a range of miniatures, or encourage children to store their miniature accessories in a single place. In the tutorial that follows, I'll give you the instructions for a 12th scale chest which will store simple horse tack. You can adapt the size of the trunk to store your choice of miniatures. Basic parts for a dolls house scale tack trunk or wooden chest. Photo copyright 2010 Lesley Shepherd, Licensed to About.com Inc.
Wood For the chest shown I used 3/32 inch thick basswood, from a 3 inch wide sheet for the main chest parts. The trim, tray and tray supports are made from wooden stir sticks. The design should be based on what your chest will hold. This one was based on the measurements for the toy saddle accessory from the Calico Critters Horse Show Set. If you have a particular item you need to fit into the chest, adapt the measurements to suit your needs, or standard strip wood measurements. It is helpful to draw out the parts on a piece of paper and use them as cutting guides once you know the measurements you need. The following parts were cut from 3 inch wide basswood (jelutong) (3/32 inches thick): Lid 2 1/8 inches deep by 3 inches across. Sides Cut Two Sides, 1 7/8 inches high, by 1 3/4 inches wide. Front and Back Cut Two, 1 7/8 inches high by 2 7/8 inches wide. Base Cut One, 2 5/8 inches wide by 1/3/4 inches deep. Feet Cut Four from Leftovers of main pieces, cut the feet approximately 3/8 inch square. Trim You may also need pieces of stir stick or 1/8 inch thick basswood to make a tray for the interior of your box, and pieces of the same craft sticks or 1/8 inch wood for the rail around the bottom of the chest, and the rails on the interior of the front and back which support the tray. Hinges I used two standard door type hinges from Houseworks, You can easily make your own hinges following the instructions for making simple hinges. If this will be used by a child, you may prefer to use a cloth hinge along the inside back of the trunk. Flat Rectangular Needle File To file out recesses for the hinges. Sandpaper Medium and Fine Grit. Fine Tweezers or brad setting tool to insert tiny 'nails' in the hinges. Gluing Jig or Clamps to hold the pieces square while the glue dries. Ruler and Pencil to mark the hinge position. Dressmakers Pins to hold the hinges in place and to set 'pilot' holes for the hinge 'nails'. If you have one you can use a mini drill for this, just choose a bit which is slightly smaller than the 'nails' supplied with your hinges. Sides and base of a miniature tack trunk held in a magnetic gluing jig to keep the shape square. Photo copyright 2010 Lesley Shepherd, Licensed to About.com Inc. Begin by drawing out your main parts to size on a piece of paper or card. Cut these out carefully making sure all ends are square, and use them as guides for cutting your main wooden pieces. If you have made measurements to suit your trunk's contents, test your pieces for fit before you cut any wood. Sand the edges of all your pieces to make sure the edges are flat and square for the best fit. Test fit the box base and sides before gluing. When your parts are all square, with edges neatly squared and sanded, apply a thin line of glue around the edges of the chest base, then glue the ends and front and back to the base, with the front and back overlapping the ends of the sides. Set your basic box in a gluing jig or clamp it until the glue dries. Make sure all the sides are square and pressed tightly against the base and the ends of adjoining pieces. Remove any glue that squeezes out when the parts are clamped. Shallow tray and guide rails for the interior of a dolls house scale wooden chest. Photo copyright 2010 Lesley Shepherd, Licensed to About.com Inc. If you wish to fit a sliding tray into your trunk, first determine how deep you want the sides of the tray to be. Consider whether you want it to pass across above any items you will be storing in your chest. You will need to have enough clearance above the item for the tray to pass. Build a tray which is less than half the width of the box, and slightly narrower than the interior width of the box (slightly narrower than the box base). Glue the sides of the tray to the edges of the tray base and set the tray aside to dry. Cut a 1/4 inch wide piece of stripwood, or a piece of a craft stick or stir stick to a length 3/16 inch or slightly less than the length of the front and back of your box. These will be the runners that will support the tray inside the box. Measure down from the top edge of the front and back of your chest to a depth slightly longer than the side height of your tray. Glue the top edge of your runner on the front and back of your chest. If you glue the pieces in place before you glue the main chest together, you can check that the runners are the same distance down on the front and back pieces of the chest or trunk. When the runners are glued securely in place, you can assemble the box as outlined in the previous step. When your basic box for the chest is dry, use a sanding block and sandpaper to square all the outside edges of the box. Take the four square feet and glue them to the corners of the box base. You can use carved wooden beads, or small pieces of carved moulding for feet if you are building a more decorative chest. When the feet are dry, measure, cut and glue a line of simple trim around the bottom edge of the box. In full size chests this serves as a 'kick board' absorbing dents and helping to stablilize the box. For the dolls house scale tack box shown, I chose to sand the ends of the trim pieces at a 45 degree angle on the sanding block in order to join the trim at the corners with a neat miter. If you prefer you can cut the long pieces of trim long enough to overlap the side trim edges. If your chest will be set against a wall, you may wish to leave the bottom rail trim off the back of the chest so it can be pushed back flush to the wall. Using a file to cut a surround to strengthen miniature hinges in a wooden chest lid. Photo copyright 2010 Lesley Shepherd, Licensed to About.com Inc. Shape the Lid The lid of the tack box or chest overlaps the chest on the sides and the front, but lines up flush with the back of the chest. To finish the lid, hold the lid at an angle to the sanding block and sand along the front and side edges to produce a slight angle that runs from the top of the lid to the center of the lid edges. Make sure your lid does not bow away from the sanding block as you sand this edge, or the decorative edge will have a curve in the center instead of a neat straight finish at the top of the lid. Run the sanding block square along the face of the front and side edge to keep it square with the angle you just sanded. Take your hinges and lay them against the underside of the lid at the back edge so that the loop of the hinge is along the back edge of the lid. Check that your hinges will go over the back of the chest so that the hinges can be attached under the lid, and on the outside of the back of the box. This should allow the hinge to open completely without catching the back of the box. Matching the lid and back placement lines for miniature hinges on a wooden chest or tack trunk. Photo copyright 2010 Lesley Shepherd, Licensed to About.com Inc.
Take the lid of your chest and turn it upside down so you can see the recesses you filed or sanded out to fit your hinges (see photo above). Line the lid up with the back of the chest so that the lid overlaps both sides of the chest equally. Mark the position of your hinges and file a slight recess for them on the back of the trunk. Be as precise as possible, especially with the recess along the side edges of the hinges. Stop often to check the fit. Fitting and gluing a hinge to the lid of a dolls house scale tack trunk. Photo copyright 2010 Lesley Shepherd, Licensed to About.com Inc. Check the fit of your hinges on the underside of the lid and the back of the trunk (hold the hinge on the back of the trunk with a pin through one of the holes while you check the fit. Make sure the hinge pin assembly sticks out at the back of the lid, and that the back edge of the lid, lines up with the back edge of the trunk. Decide whether you prefer to attach the hinges to the back of the trunk or the lid first. If you have little experience with fitting a dolls house scale hinge, you may prefer to fit the to the underside of the lid while it can be laid flat to work. Putting glue and tiny pins together is a very finicky operation. If you have never done it before, practise with an extra hinge, 'nails' and two pieces of scrap wood, before you attempt to attach hinges to your finished piece. File or sand the top edge of the back of the chest at the points where you made the recessed areas for your hinges. This will prevent the hinge from binding on the lid when you try to shut it. Check that your hinges open and close easily. File the top of all the 'nails' supplied with your hinges so that they are flat instead of round, this prevents them from pushing the hinge open. Trim your 'nails' so that they will not go completely through your wood when you push them through the holes in your hinge. You can use a file, tin snips or wire cutters to shorten the 'nails'. If possible, file the shortened hinge 'nails' so that the ends are not completely blunt. "Nails' tend to fly away from hinges, prepare extras. Drill pilot holes for all the hinge 'nails' using a mini drill or a pin. Apply a small amount of glue to one recessed hinge slot and place your hinge into the slot, holding it in place with a dressmakers pin. Hold the 'nails' with a fine tipped pair of bent nose tweezers, or a brad holder, and press them through the holes in the hinge into the wood beneath it. Use the flat side of a pair of pliers or a metal ruler to push down on the pins pressing them into the glue and the wood. Take care you do not get glue into the working part of the hinge. Once you have one 'nail' in place, remove the pin you used to hold the hinge in place and insert the rest of the 'nails' through the holes in the hinge. Check that the hinge opens and closes properly and that the hinge pin will sit flush with the back of the trunk lid. Adjust the hinge if necessary. Attach the second hinge to the back or the top, whichever you are starting with and leave the hinges to set up in position on one piece of the chest, before you attempt to glue and pin them to the other piece. NoteYou must use a glue which will bond wood and metal reasonably well. Two part epoxy glues are best, but there are some 'rubber toughened' cyanoacrylate (super) glues which appear to work well for miniature hinges. I tried the 'Gorilla Super Glue' and was reasonably pleased with how well it held the hinges. I need to test it more. Glue the second half of your hinges in place to the lid or back of your chest. Calico critters horse show figures with a 1:12 scale wooden tack chest that holds their saddle, bridle, trophy, grooming equipment and other accessories. Photo copyright 2010 Lesley Shepherd, Licensed to About.com Inc.
You can leave the wood of your tack trunk natural and apply a coat of clear acrylic glaze followed by furniture wax to obtain a natural finish for an unpainted trunk. If you prefer you can paint your tack trunk in your stable colors and add cut outs or decals to decorate the trunk. If you are making a trunk as a hope or blanket chest, you can stain or paint the wood. Many of these original chests (including the one I based my design on) were painted with a very durable milk based paint, or finished with a vinegar paint decorative finish. Many painted wooden chests were also decorated with stencils, and there are some small brass stencils in craft stores which can be used on miniature trunks. This basic lidded box can be made in many sizes and finishes for a range of small scale scenes.